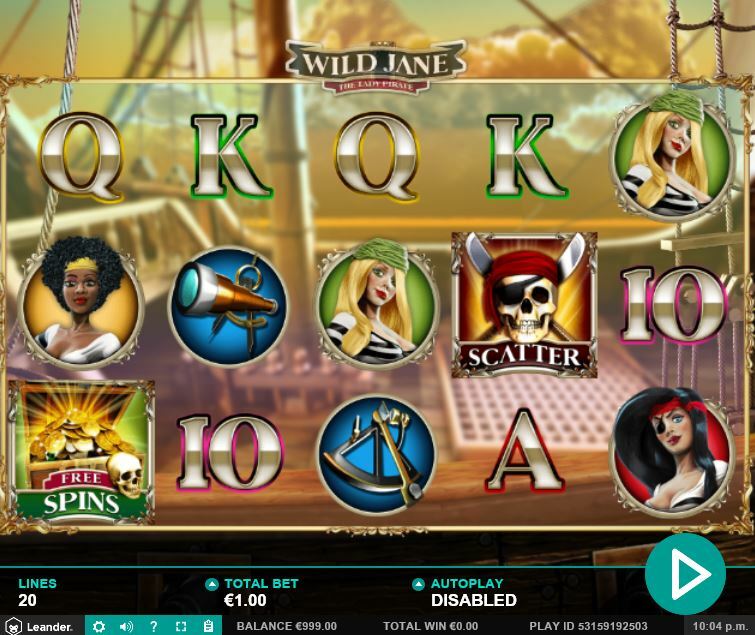 Wild Jane slot may have you thinking of a jungle theme centred around Tarzan, (like Microgaming's very sterile attempt) but that's not that Jane we have her. Instead a 'Lady Pirate' and an all-female crew of Buccaneers seeking treasure as they sail their galleon across the seven seas. The transparent reels are set against a background of the deck of their ship and we spin the reels accompanied by dramatic classical music to fit the theme. There are quite a few games with this subject, Pirates Treasure and Pirate's Plunder spring to mind so will Wild Jane deliver you any bounty from her swashbuckling exploits? 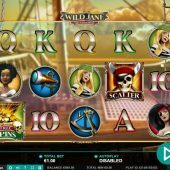 The attractive redhead that is Pirate Jane is the game's expanding Wild appearing on reels 2 to 5 only, so the first award to mention on this 20-line slot is the Red Lady with the eye-patch paying 125x bet for 5-of-a-kind followed by the Blonde at 40x and the Afro Pirate at 15x for the 5. We have some tools of the trade too with the telescope and sextant paying 12.5 and 7.5x respectively. Like these icons, the card values all appear singly and pay between 2.5 and 6x bet. There are two bonuses to be had on this good ship too but don't confuse them with the separate scatter in the form of the Skull and Crossbones which is a simple cash award paying 5x bet for 3, 25x for 4 and 100x for all 5. You may see 3 crossed-pistols symbols with a red background land on the centre 3 reels only. Should this happen, Jane will waste some good beer by getting you to choose 6 tankards for her to blast at with her pistols awarding cash values up to a maximum of 49x bet. Beth The Blonde pirate - 4 shovels and a maximum possible outcome of 15 spins at 4x multiplier. Eli The Afro pirate - 6 shovels and maximum outcome of 20 spins with a 5x multiplier. May The Eye-patch pirate - 8 shovels with best possible result of 25 spins at 6x multiplier. So you can dig by choosing from the 9 treasure locations on the beach, one choice for each shovel. Only you have a problem: you can unearth a bomb which will blow your pirate and any spins and multipliers she has dug up thus far to kingdom come! If this happens you get a default 10 spins with 1x multiplier. During these free spins you get a fixed Wild reel 1 but the the rest of the reels are different with the expanding Wilds removed from reels 2 to 5.